Our yoga practice is at it’s best when we are practicing regularly. By taking up this challenge, you’ll be practicing within a community that will encourage and support you through the process. Take this opportunity to elevate your practice to the next level. 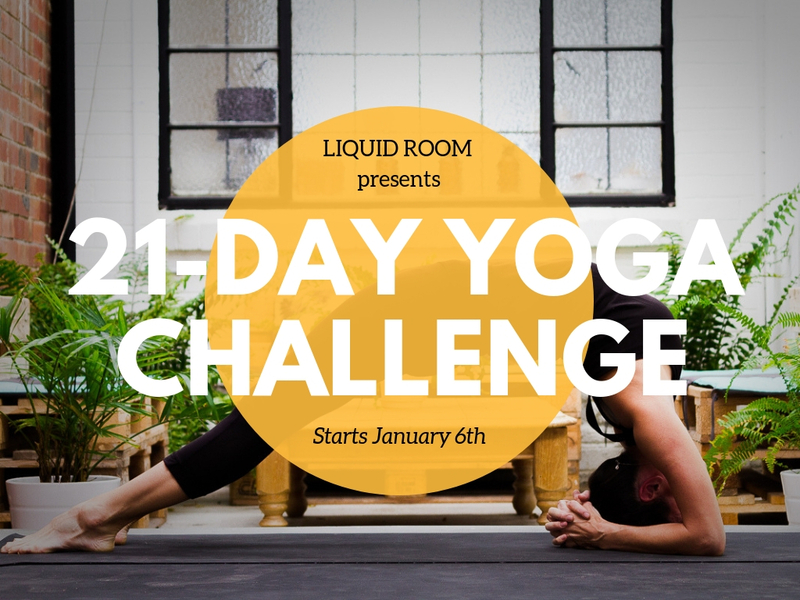 We offer classes that cover every aspect of YOGA which include Foundation Flow, Slow Flow, Vinyasa Flow, YIN Yoga, and Meditation throughout this challenge. You’ll discover yourself in a different light at the end of this journey. For more descriptions of our yoga style, click here. Daily Check-in “Smiley” Board, in Studio. If you are new to Yoga and think this looks too intense – think again! The Yoga challenge is a great way to explore a beginning practice, building strength and flexibility in the body quickly. Mentally you will find your Mind relaxing more every time you arrive on the mat. The 21 Challenge is perfect for a completely immersive experience! We recommend adding in at least two Meditation or Yin / Meditation classes each week to encourage recovery and grow further in your dynamic practice. Take the Challenge – we dare you! The Challenge Begins Sunday January 6th 2019. Join our FACEBOOK GROUP to receive updates, inspirations, tips, and tricks. Share your progress, comments, and questions here as well. Simply Click here to join! Each participant is to practice a minimum of 5 days per week, aiming to practice everyday within 21 days. Current members who are on unlimited 6-months or 12-months yoga passes can join for FREE! Passes must be active during this challenge and this does not postpone or place your membership on hold. Please email us at enquiries@liquidroom.com.au or call us at 9598 9313 to sign-up. What happens on your first day of challenge? Book into your first class via the Liquid Room website or the MindBody App. You can book for ANY of the classes on the 6th of January. We will also provide you with a FREE DOWNLOADABLE e-book that will help guide you through setting your daily intentions for 21 days, along with some tips on how to maximise your practice throughout the challenge. I’ve reached my last day, where do I go from here? To help you continue on your journey and enjoy a well deserve recovery, you will receive special offers on Yoga passes as well as offers on all of our other services at Liquid Room, i.e. Floatation Therapy and Massage to help you maintain your health and wellbeing journey. Keep an eye out in your email inbox for our offers! Once confirmed and paid, this challenge is Non-refundable and Non-transferable. Please ensure that you have medical clearance to take up this challenge if you’ve had previous medical history that you believe might inhibit your practice. You will be practicing at your own leisure with guidance during the class that is relevant to the practice. Existing clients with unlimited yoga passes of 6 months or 12 months can join for FREE! Please note that this does not allow you to suspend your membership and your membership must active during the challenge. Please contact us to directly to add you into the challenge.